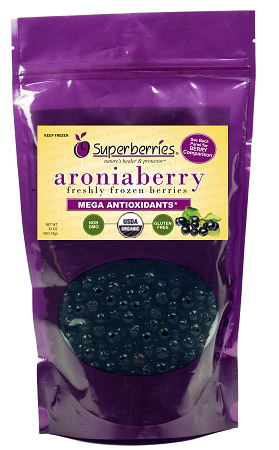 Place aroniaberries in food processor for about 15 to 20 seconds (or until finely chopped). In 1 1/2 quart saucepan, combine chopped berries and all remaining ingredients; mix well. Cook over medium heat until mixture boils, stirring occasionally. Boil 1 minute, stirring occasionally. Strain mixture through metal strainer. Cool to room temperature. Serve over angel food cake, pound cake, frozen yogurt or try on pancakes or waffles.